Over the past few weeks, our advice nurses and pediatricians have fielded hundreds of calls related to measles. Below are some of the most commonly asked questions and our answers to them. We hope you find this information helpful. If there’s anything else we can answer, please get in touch! We’re happy to be your family’s go-to resource for advice and peace of mind. Take care out there! Q: How can I check if my child is vaccinated for measles? A: Look on their shot record at home or in MyHealth for completion of at least one vaccine called Measles, MMR, or MMRV. 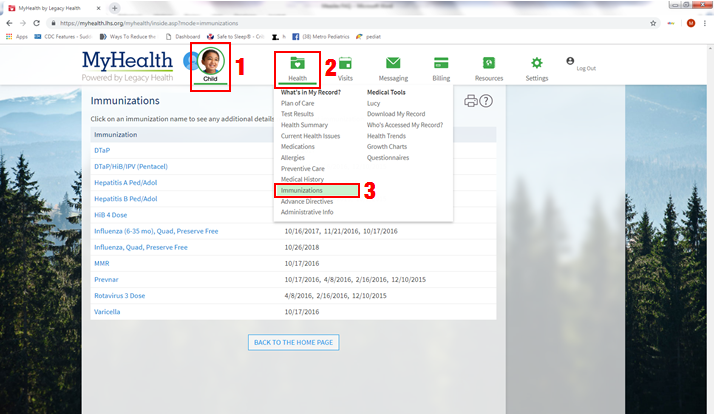 To view their record in MyHealth, select your child’s photo and go to the Health tab, then select Immunizations from the dropdown menu. If you do not have a MyHealth account or cannot find your child’s immunization record, call us to check. If you would like to sign up for MyHealth, complete the MyHealth Proxy Access Request form and return it to us. Q: I think my child may have been exposed to measles. What do I do? A: STAY HOME and call your pediatrician’s office. We’ll help you monitor symptoms and discuss what to do next. A: The measles vaccine is very effective. One dose of measles vaccine is about 93% effective at preventing measles if exposed to the virus. Two doses are about 97% effective. A: Very few people (about three out of 100) who get two doses of measles vaccine will still get measles if exposed to the virus. Experts aren’t sure why. It could be that their immune systems didn’t respond as well as they should have to the vaccine. But we have good news: Fully vaccinated people who get measles are much more likely to have a milder illness AND are way less likely to spread the disease to others. Q: My child is less than one year old. Can they be vaccinated for measles early? A: MMR is a live virus vaccine that works best (creates the strongest immune response) when given at 12 months of age or older. It is safe to give an MMR vaccine to infants who are between six and 12 months, but the younger they are, the less likely they are to benefit from it. Infants who receive MMR before 12 months might receive protection during the outbreak, but will still need the standard doses given after 12 months. Metropolitan Pediatrics and the CDC are not currently recommending early MMR #1 for children less than one year of age, but if you still want to have your child get an extra MMR early, please call our office for an appointment with your pediatrician, so that we can discuss potential risks and benefits further. Also, please note, most insurance companies will not pay for an MMR vaccine given early without a change of recommendation from the CDC or public health (except for the overseas travel mentioned below). Q: My child is older than one year old and has had their first measles vaccine. Can they get their second vaccine now, even though they are not yet 4 years old? A: The second MMR vaccine is safe and effective if the child is older than one year old, and it has been at least 28 days from the first vaccine. 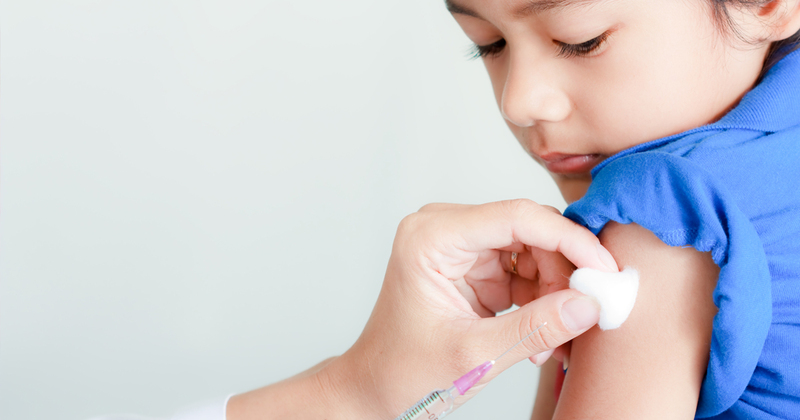 Metropolitan Pediatrics and the CDC are not currently recommending giving the second vaccine early, but if you want your child to have the vaccine now, you can call our office and ask to speak to our nurses for more information. If you do not have further questions, and you know you want your child to get the second MMR now, you can call our office and schedule a shot-only visit. Q: How long does it take for measles symptoms to appear? A: Measles is a highly contagious viral infection that spreads through contact with virus-infected saliva or mucus that gets into the air when an infected person talks, coughs, or sneezes. It takes about 10-15 days for symptoms like cough, runny nose, sore throat, fever, red eyes, and sneezing to show up after being exposed to the virus. Over the next few days, a splotchy, red rash will develop, starting on the face and spreading to the rest of the body, accompanied by a high fever (104° to 105.8° F). Q: How long is a measles-infected person contagious? A: A person with measles can spread the virus to others for about eight days, starting four days before the rash appears and ending when the rash has been present for four days. Q: How long does it take the measles vaccine to be effective? A: It takes 10-14 days for the measles vaccine to be fully effective. Q: If my child received the measles vaccine early (before one year of age), why do they still need two more shots? A: Even if we give the vaccine early, the immune system is not developed enough to guarantee long-term immunity, so we’ll need to start again with the first dose at one year of age. The second dose is given at four years. Q: Should I be concerned if we are going to travel? Babies six to 11 months old should receive one dose of MMR vaccine before leaving. Children 12 months of age and older should receive two doses of MMR vaccine (separated by at least 28 days) before departure.